Dutch artist Petrus van der Velden, who emigrated to New Zealand in 1890, was fascinated by the Ōtira area, and painted a series of pictures there over 20 years. This is the last of the series, completed in 1912, the year before his death. 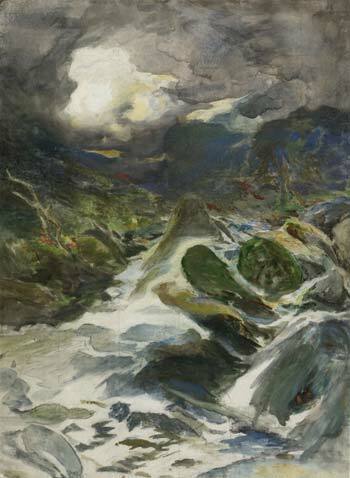 Heavy rainfall and flooded rivers are part of life in alpine regions, and van der Velden captures the awe-inspiring forces of nature with his use of light and shade.